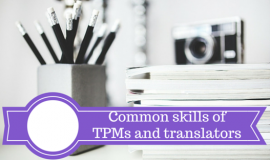 When I come to the end of my Translation Project Management courses, I usually explain to the students the main skills I expect from translation project managers (TPMs). I use star ratings to illustrate what I think they should mainly master to work as TPMs. In the following article, I will briefly go through those skills, organising them according to my own –very personal– rating. I will also indicate how each one of those skills apply to translators. Personally, I prefer to work with project managers (PMs) who have a translation background, whether they are previous translators or translation students who did an MA in Localisation or Translation Project Management. I’ve had an opportunity to work with dozens of TPMs with various profiles and at the end of the day, I ended up hiring only PMs with a translation background. I worked many years in a big translation company, where I understood how difficult it was to find really good TPMs. For a while, the company focused on people with an IT background, assuming they would be good at managing software localisation projects. Afterwards, they mainly selected candidates with a financial background, hoping those would guarantee comfortable gross margins. In the end, we realised that the most suitable people mainly came from the translation market. In short, people understanding the specificities of languages, the differences between the multiple cultures, the requirements of linguists, the importance of terminology, the usefulness of style guides, and so on. I am not saying that TPMs without a translation background underperform. There are of course many exceptions. But I think that a practical and personal knowledge of such a subject really helps you to manage projects effectively. It is obvious that mastering languages is essential for translators. Yet, some professional translators actually have other backgrounds and do very well in this market. I’ve had an opportunity to work with some engineers who started translating some documents, enjoyed it and later on decided to work as freelance translators. However, I think such cases are not very frequent. In my opinion, it is easier to study translation and then specialise in an area than to graduate in another sector and learn afterwards how to translate in a professional way. Most translation project managers handle several jobs a month. If they only manage one, it will be a very big project made up of several components and/or files, and possibly into a high number of target languages. Organisation is key not only to know the status of each project and file, but also to identify their type and classify them correctly, to follow the numerous requests from clients or subcontractors, to track the various issues, etc. Even though some tools can help multitasking PMs in their daily work, the way of organising everything properly to guarantee on-time delivery of quality projects remains in the hands of the PMs. Translators work exactly the same way, handling several jobs at once, working on a big job for a while or mixing both. Therefore, being efficiently organised is necessary for them too. Filling in some tracking files to be aware of the status of their projects, saving the files in correct and consistent project directory structures, sorting their emails to have a clear view of their inbox, etc., will certainly help them to optimise their work. I have always been impressed by the way TPMs behave responsibly when dealing with their projects. Making sure they are delivered in line with all the required criteria is really fundamental for most of them. They take pride in their work, enjoy clients’ praise (who doesn’t?) and, whenever possible, try to improve processes along the way, to the advantage of the translation company’s clients, subcontractors or managers. It goes without saying that translators also feel responsible for the quality of their target texts. For most of them, it is not only a matter of delivering their translations and quickly forgetting about them, but rather feeling proud of the quality of their work. This sense of responsibility is not only key to the success of a job, it also relates to the sense of fulfilment important to all professionals. Project Managers need some training and assistance with the first jobs they manage. Unfortunately, in most translation companies, everyone works under a lot of pressure, running several jobs in parallel, and they don’t have time to look after new PMs, at least not as much as the latter would like or need. Independence in their work and learning curve is an asset for PMs. If they can try to analyse a situation on their own, understand the issues or potential risks, find solutions and test new processes, they will gain experience and will be trusted by their colleagues and superiors. It does not mean that they cannot communicate with others and exchange ideas or even ask for approval, but rather that they should not only count on others to clarify the various situations they face. Translators are independent workers. Sometimes they can benefit from reference material provided by clients, instructions from translation companies, and even help from colleagues. However, for some jobs, they must make all the decisions and look for the appropriate material themselves. They might be lucky and have responsive clients validating their choices, but in many cases they will truly be the only one on-board from A to Z, with only themselves to rely on. In today’s world, every translation project manager works with a computer and uses many applications every day, specific to project management or not. However, no one needs a master’s degree in IT to manage translation projects, whether those include only simple documents or software, websites and multimedia components. Most of the pure management tasks can be carried out easily using project management software or a simple program like Microsoft Excel. Learning how to handle computer-aided tools (CAT) or even machine translation (MT) software is feasible for every TPM. Getting some more insight into the way a website can become multilingual, or the way a target software should be tested, might require some more investment from PMs, but nothing out of reach for non IT-professionals. The same goes for translators. Nowadays, overwriting source text in a word processing program or exploiting CAT tool features is quite common for translators. They take advantage of their computer for the daily tasks and most of them are able to quickly master a new program for the needs of a specific project. Information Technology is part of our lives, especially our professional lives, but advanced technical knowledge is not normally necessary since average, functional skills suffice. To guarantee the timely delivery of their projects, TPMs often have to prepare schedules, either focusing on one single big project or including several small jobs. They need to make sure they will assign enough resources to the various tasks related to the project steps and components, while planning some back-up time in case issues arise. Even if project graphical representations might not always be useful, they need to draw up schedules applying the correct production metrics and taking into account their resources’ availabilities and skills. Based on that, they will accept the client’s deadline or propose their best delivery date to ensure optimal quality. Translators sometimes face difficulties organising their schedule when they have to deal with large projects or several projects at the same time, or even translations on unknown subjects. They also have to plan some back-up time for their own constraints, whether professional (client meeting, unexpected jobs, administrative tasks, etc.) or private (family, illness, computer crash, etc.). Being able to secure the delivery dates agreed upon with the clients is often vital for them. Project managers are the hub between clients, resources and translation company management. All data regarding the projects goes through them. They should be good communicators to ensure that the right people receive the right information. They also have to filter the project data so that nobody gets overloaded with unneeded information. Last, but not least, they need to make sure that communication is smooth enough and does not displease, or worse offend, anyone. Depending on the way their work is organised, communication might be a minor factor or a crucial one for translators. Some translators have nearly no contact with other people. They get their assignments through the Internet, receive automatic notifications, then download their files from a CMS and upload them back in the same system after completion. At the end of the month, they send an invoice and do not really communicate with anyone. Others, on the contrary, are in touch with their clients on a daily basis and have to be very good communicators to maintain and develop their business. Some might also work in virtual or on-site teams and communicate intensively with other linguistic resources or even with technical participants on specific projects. Clients change. Projects change. Resources change. Every item within a translation project can be subject to change. Translation project managers have to be flexible enough to handle these changes, adapting budgets, changing schedules, implementing new instructions, etc. They need to remain open-minded and accommodating to comply with the new situation, if possible without the clients and other participants noticing the trouble these changes cause. Sometimes translators also have to cope with changes. Suddenly, they are asked to stop working on a project to work quickly on another top priority one. Changes in terminology or style preferences decided by a new client reviewer might oblige them to modify parts of their translation when it was ready to be delivered. For some projects, they might even have to be flexible enough to learn new tools quickly or follow new processes. The project participants recruited by the PM need to feel that the latter is fully in charge of the project. Some junior project managers might look hesitant and their inexperience might be quite visible. They need to develop their leadership skills and be supported by senior colleagues or managers so that clients and resources will not have any doubts about their capabilities to lead the project to a complete success. Good leaders will also remain open to others’ opinions or possible adaptations, but will need to show that, in the end, they are the ones making the decisions. The leadership factor might not really apply to translators, except when they work in teams or in networks or when they play a specific role, such as terminology coordinator or linguistic lead. Nevertheless, clients should never need to doubt that their translators completely master their projects and will ensure they have a successful outcome. Managing translation projects is stressful. No doubt about that. However, this factor should not put people off working as project managers. Stress can be managed, or let’s say reduced, so that working conditions are good. Most stress is linked to the various problems arising in the course of a project. Performing a very thorough analysis at the very beginning of the project will, therefore, lessen the risks and hopefully limit, or even remove, the potential issues. It is also important to leave the job behind at the end of the working day. Otherwise, the level of stress remains constant, sometimes preventing the PMs from taking a step back and considering the situation with a clear mind. When overloaded with translation projects, when feeling unable to quickly master a specific subject, or even when realising how hard it is to find relevant reference material, some translators end up working in very stressful conditions. They also have to learn how to manage this feeling since it is quite obvious that their level of concentration can be greatly affected by intense stress. By rating the “Finances” factor with only one star, I’m not implying that the financial aspect is not important in project management. I’m simply trying to underline the fact that TPMs do not need to be financial experts to manage translation projects. Translation students are often very worried about this specific area since they have not usually dealt a lot with figures during their linguistic studies. I believe that a few hours are enough to explain the basic concepts they need to manage translation projects. I even think it is more a question of accuracy and logic than of pure financial skills. Being able to define rates, prepare a quotation, create an invoice or a credit note, calculate a gross margin and a few other basic tasks is indeed within the reach of most master students in translation or junior TPMs. For translators finances are also important. But not so difficult to handle. They can use specific programs or simply work in Microsoft Excel. Once again, it is more a matter of being accurate and logical to guarantee profitability when accepting or proposing rates. Freelance translators, like any freelancer, should always carefully check any PO they receive, make sure to invoice ALL jobs delivered, keep an eye on their accounts to track unpaid invoices, etc. The riskiest aspect remains keeping on top of accounting issues, for which I would strongly advise referring to a professional accountant. There is a myriad of skills to consider for managing projects, as a translation project manager or as a translator. We also explore others during the Translation Project Management courses, such as negotiation, forecasting, reporting, delegation, integrity, etc. I deliberately chose to list here only those I insist on at the end of my TPM courses. My own rating can of course be discussed. Mostly the first one about languages. Many translation project managers do not have any translation background and perform extremely well. My approach during the courses is to show translation students that project management in translation is NOT something unreachable for them if they didn’t follow an economics course during their studies. On the contrary, the goal is to demonstrate to them that, thanks to their background in languages, they are able to grasp easily how to analyse, plan, follow and complete translation projects. It usually helps them to gain confidence in their own skills and hopefully make them aware of other perspectives for their future career. This article was originally published on The Alexandria Library blog, which sadly closed down in March 2016. Nancy Matis has been involved in the translation business for around 20 years, working as a translator, reviser, technical specialist, project manager and teacher, among other roles. 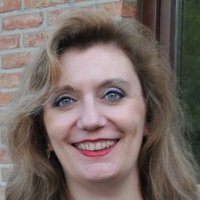 She currently manages her own translation company based in Belgium and teaches Translation Project Management at four universities. She also ran seminars at numerous universities across Europe and was involved in some European projects, designing and evaluating training materials for future translators and project managers. Nancy is the author of the book How to manage your translation projects, originally published in French and translated afterwards into English. You can find more information on her website and her LinkedIn profile.